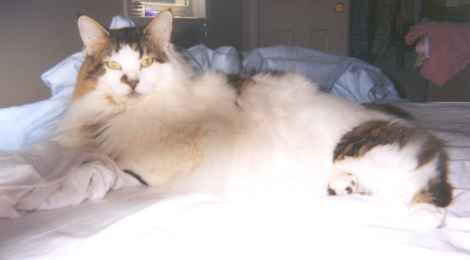 Marshmallow was adopted in the summer of 2001 by Sara, who writes, "The name says it all about his personality - he is a marshmallow. He was a bit of a street cat when I got him, but he quickly adapted to home life and he is now a full-blown Luxury Kitty! He loves his toys and has quite the personality. He has lots of chirps amd meow greetings for me when I come home from work, and loves to play, chase, flop and play 'fetch'." Ralph and his daughter Alison write, "We used to have a sofa. We used to have an afghan. Now we have Holden. Holden came into our lives in October of 2002. Best guess is that he was about three years old. It took a good six weeks for him to come out of his shell; more properly behind the washer and dryer (his Kenmore phase) or under the sofa (the Broyhill era.) Now he's a full time member of the family and we're all happy. 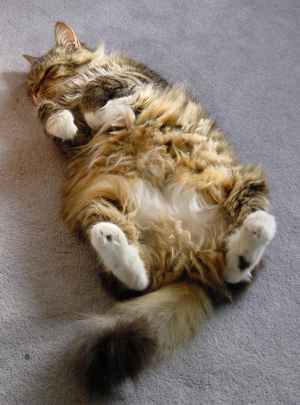 Anyone who's looking for a cat or kitten hears about Kitty Angels from us." 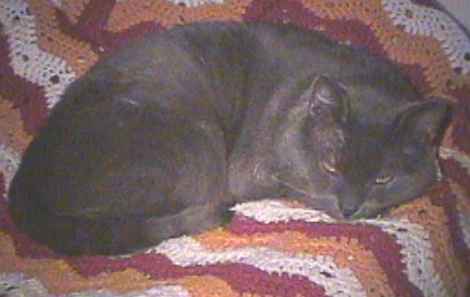 Kathryn and Angie write, "Boots was four years old when we got him in 2000. At first he was really shy but he got used to it. Our other cat Popeye still really doesn't like him but that is ok. He can be very shy when we have other people that he doesn't know come to our house. We love our cat dearly and we thank you for helping us pick him out - he is a wonderful cat. As you can see in the picture Boots has gotten pretty used to our house!" A sad update: "I just wanted to say thank you for helping us get him, but due to a tumor that was on his abdomen, he was put to sleep today. I just want to say thank you for the many happy years you have helped bring us with having Boots. He was a wonderful cat. He lived a long life since we got him - we had him from 2/23/00 - 12/2/05. Thank you." 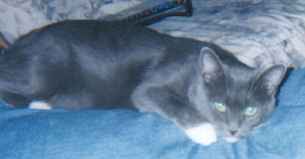 Allen and Joanne write, "We adopted Mittens in October 2002. It took her less than a week to realize she owned the house. "She has been a blessing to us and as you can see is a people cat. She is a very intelligent animal (we are a little prejudiced of course.) She's so adorable, she greets us when we come home from work. Her kisses are so delicious! "Thank you Kitty Angels for all the hard work you people do and for our new addition to the family."